It’s a good idea to use words that your customers understand on your website (obviously) – especially on a page that involves payment. 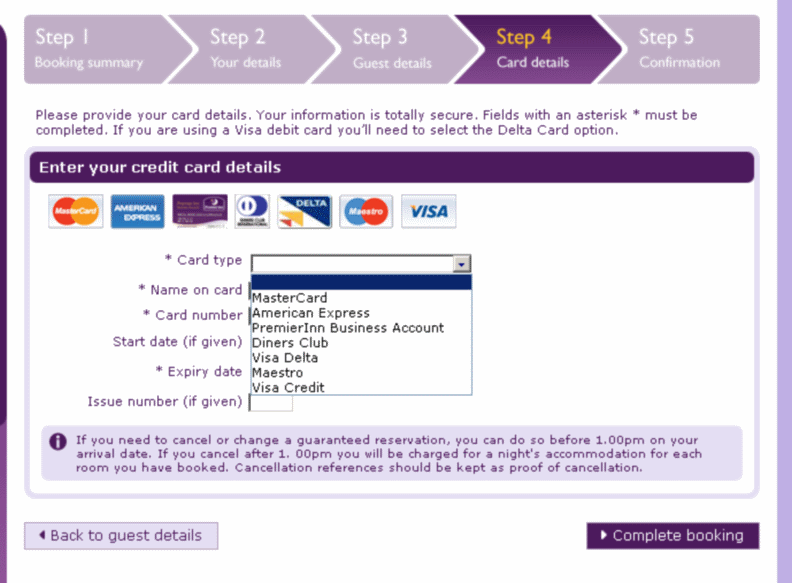 Recently, when I was ready to pay by Debit Card for some rooms at the otherwise great Premier Inn site, I was flumoxed when trying to find the right card type for my Visa Debit from the drop down list. Imagine you’ve spent a few precious minutes booking some rooms and now want to pay by Visa Debit card. Now click on the image below and think about what you would choose? Maybe everyone else refers to it as a Visa Delta card? I think not. But if I’m wrong please correct me. So, the correct choice from the drop-down list for my Visa Debit card is Visa Credit. Obvious. Not. Ideally it shouldn’t be asking for the card type at all. The first 4 or 6 digits identify the card type, and an online payment service provider have the BIN file that provides this identification.